An early entry and more free music! 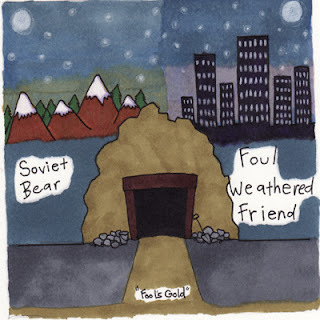 This 5-track split, Fool's Gold is brought to you by Tim Browne (Soviet Bear) of the Fort Collins, CO-based punk band Elway, and Steve-O (Foul Weathered Friends) of The Holy Mess, from my adopted hometown of Philadephia. It's available for free from Death to False Hope Records. Though the two are veteran punkers, Fool's Gold shows their acoustic sides. Alternately contemplative, peaceful, and solemn, both songwriters allow themselves to break free of the two-minute anthem format and stretch out. But that doesn't mean that either of them have broken free of punk altogether. As Mike Ostrov observes on Ninebullets, this collection inhabits a peripheral zone between punk, rock, and your average singer-songwriter-type introspection. And it ain't half-bad.